China swept the medals at the first two Youth Olympics, but a missed dive by a World Champion opened the door for a Colombian champion. 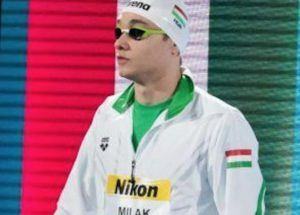 Kristof Milak will be gunning for gold in the men’s 200 fly final tonight, as he looks for her first butterfly title of the meet after missing out in the 50 and 100. Rewatch day 5 finals from the Youth Olympic Games in Buenos Aires. 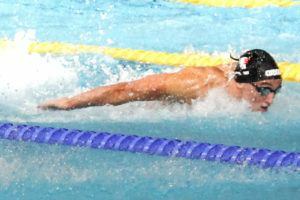 Denied 100m fly gold, Hungary’s Kristof Milak is ready to give it his all in the 200m fly final tonight in Buenos Aires. 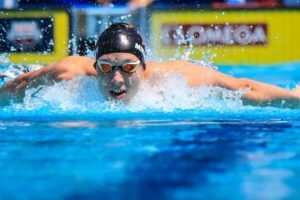 Day 3 finals from Buenos Aires at the Youth Olympic Games will feature a total of five finals and four rounds of semi-finals, with a few key clashes to look forward to including the men’s 100 butterfly. There we’ll see Hungarian Kristof Milak and Russian Andrei Minakov go head-to-head, as Milak will look for his third gold medal of the meet after winning the 400 and 200 freestyles on days 1 and 2. The Hungarian is certainly the favorite, especially considering he won silver at the World Championships last year in 50.62, but Minakov has looked strong here and was just a tenth off his best time in the semis in 51.94 to qualify 1st. Milak qualified 3rd (52.56) behind another threat, Italian Federico Burdisso (52.43). 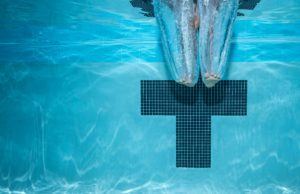 The timed final of the women’s 800 freestyle should also be an intriguing race with Delfina Pignatiello of Argentina and Ajna Kesely of Hungary renewing their rivalry after battling to gold and silver at the World Junior Championships last summer. In terms of finals tonight we’ll also see Czech swimmer Barbora Seemanova in the women’s 100 freestyle, and a loaded women’s 200 back lineup that includes Kaylee McKeown (AUS), Peng Xuwei (CHN), and Laura Ilyes (HUN), not to mention the top-2 prelim seeds Rhyan White (USA) and Madison Broad (CAN). The men’s 400 free relay will close things off. 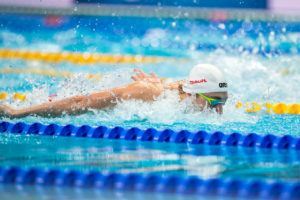 After finishing 2nd to her at last year’s World Juniors, Hungary’s Ajna Kesely defeated Delfina Pignatiello on her home soil for gold in the women’s 800 free in a time of 8:27.60. Kesely also picked up silver at the European Championships in August in what currently stands as her personal best of 8:22.01. Pignatiello, who holds the Argentine National Record in 8:25.22, began to lose ground to Kesely around the 600m mark and settled for silver in 8:32.42. Austrian Marlene Kahler took off over a second from her best to win bronze in 8:36.57. 2017 World Junior silver medalist Sara Junevik of Sweden, the top seed coming into the meet, won the first semi-final of the women’s 50 fly in 26.75 over a competitive heat that saw five women go sub-27. Belarusian Anastasiya Shkurdai and German Angelina Koehler dead-heated in the second semi, tying for the top seed going into finals in 26.65. No one else there went 26, with Mayuka Yamamoto of Japan the only other swimmer making the final from that semi in 8th in 27.12. Russian Daniil Markov blasted a personal best time of 22.30 in the first semi of the men’s 50 free, a time that stands up as the fastest heading into tomorrow’s final. Sameh Abdelrahman of Egypt won semi #2 in 22.48, followed by the versatile Thomas Ceccon (22.57) of Italy and Artur Barseghyan of Armenia who set a new National Record in 22.69. 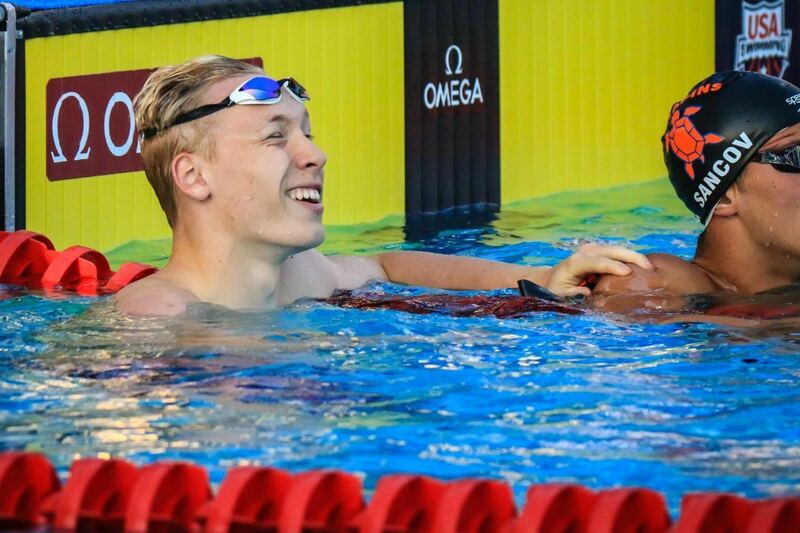 European junior champion Bjoern Seeliger of Sweden sits tied for 5th with Brazilian Andre Luiz Calvelo de Souza in 22.71, while another Swede Robin Hanson looks like he’ll have a swim-off after tying for 8th with Korean Yooyeon Lee in 22.85. Moldovan Tatiana Salcutan overtook Canadian Madison Broad on the last 50 to win gold in the women’s 200 back in a time of 2:10.13, just .01 outside of her personal best and national record time of set at the 2017 European Juniors. Broad lowered her best of 2:10.73 from the Junior Pan Pacs down to 2:10.32 for silver, and Kaylee McKeown, who owns a best time in the 2:06s, rallied after sitting 5th at the 150 to jump into the bronze medal position in 2:10.67 over American Rhyan White (2:10.95, new best time) and China’s Peng Xuwei (2:11.77). Andrei Minakov backed up his strong semi-final swim with an incredible performance in the 100 fly final, turning .01 back of Kristof Milak at the 50 before bulldozing his way to the finish in 26.90 to win gold in a time of 51.12. 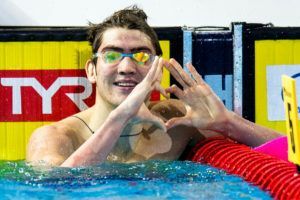 Not only does that swim obliterate his previous personal best of 51.84, but it also breaks the Russian National Record of 51.16 set by Egor Kuimov at last summer’s World Juniors. Milak couldn’t match Minakov coming home and ended up almost four-tenths back for silver in 51.50, and Italian Federico Burdisso moved up from 5th at the 50 to take bronze in 52.42 over Shinnosuke Ishikawa (52.52) of Japan and Ihor Troianovskyi (52.73) of Ukraine. Anastasia Makarova of Russia turned 7th at the 50 in the second semi of the women’s 100 breast but powered home in a blazing 35.40 to come through the field and take the heat win in 1:08.75. That time got her by Lithuanian Kotryna Teterevkova‘s 1:08.80 from the first semi for the top seed overall. Teterevkova and Makarova won gold and silver at the European Juniors this summer. Ireland’s Niamh Coyne was the only other swimmer to break 1:09 for the third seed in 1:08.90, while her countrymate Mona McSharry, the 2017 World Junior champion, barely snuck into tomorrow’s final in 8th. After slipping into the semis in 15th, 50 breast winner Agne Seleikaite stepped up her game and placed 7th overall for a berth in the final in 1:09.55. World record holder Kliment Kolesnikov improved upon his prelim swim to take the top seed heading into tomorrow’s 50 back final, bringing his 24.74 from the morning down to 24.56. We’ll see how close he can get to his 24.00 from the European Championships in August in the final. Norwegian Tomoe Hvas had a big drop from the heats to take the 2nd seed in 25.12, dropping his previous best of 25.55 and bringing himself within three-tenths of their national record. Kenzo Simons of the Netherlands was 3rd to those two in the second semi and ends up 3rd overall in 25.81, while Thomas Ceccon followed up his impressive 50 free from earlier in the session to win the first semi and take 4th overall in 25.98. Barbora Seemanova led wire-to-wire as she wins gold in the women’s 100 freestyle in a time of 54.19, lowering Anika Apostalon‘s Czech National Record of 54.28. Yang Junxuan, who has a pair of 53-second splits on relays at the meet, closed on Seemanova slightly coming home but was too far back and settles for the silver in 54.43, while Neza Klancar was even faster coming home to take bronze in 54.55 and break the Slovenian National Record previously held by Sara Isakovic at 54.86 from all the way back in 2008. The Russian men won gold in the 400 free relay by close to three seconds thanks to a pair of blistering legs from Kliment Kolesnikov and Andrei Minakov. Kolesnikov led them off in a scorching 48.04, including a ridiculous second 50 of 24.65 to lower his PB of 48.17 set on day 1 leading off the mixed relay. That gave them a two second lead right off the hop, and Daniil Markov had a solid 49.58 swimming 2nd to maintain that lead. However, Andre Luiz Calvelo de Souza dropped a 48.87 on Brazil’s third leg to erase the Russian lead, moving past Vladislav Gerasimenko (51.56) to give them the advantage heading into the last exchange. Minakov proved too quick for Vitor Pinheiro de Souza on the anchor, splitting 48.93 to give Russia the victory in 3:18.11. Brazil, who had a second sub-50 leg from Lucas Peixoto swimming 2nd (49.70), won silver in 3:20.99, and the Italians took bronze in 3:22.01 with key legs from Federico Burdisso (50.06) on the lead-off and Thomas Ceccon (49.33) going 2nd. 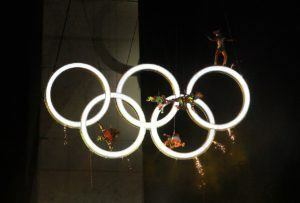 A good headline photo chosen by SwimSwam. Brazil last guy(Vitor Pinheiro) wasn’t good at freestyle(PB 53mid). He did extra training prior to the champs and did a very good(for his standards) 51.87 closing. Not surprising after his 21.2/1.41 short course swims last season and his long course back WR and other fast times, but anytime an 18 yr old goes 48.0 that’s impressive.